Maybe I spoke too soon! The day after posting this I noticed a small but significant pool of oil under the Breva. Having explored it with my local dealer, our best guess is engine seal. We've agreed a date for him to go in and deal with it. It had 7k on the clock when I bought it nearly two years ago and now has 17k on the clock, so I'm not sure I can put it down to hardening while in storage; there'd always been a slight oiliness on the back of the sump, but nothing that dripped so it didn't bother me. That said, the sound and feel of the bike as I rode it today still puts a smile on my face, and any bike will have its moments. I had a small but significant pool under the rear of my Breva a couple of days ago, because I pulled the rubber bung out of the airbox drain or some such thing and it drained all the oil out of the pipe! 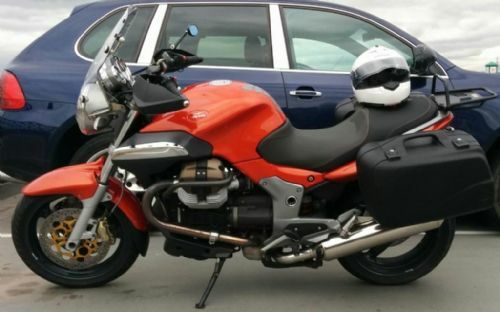 I've got a 2007 Breva 1100 on a 57 plate, which has just done 24100 miles - today. Super bike. It has enough grunt when you want it and handles really well. I've also fitted Helibars and lowered pegs. I did have a hot start problem but resolved this by fitting a direct battery feed to the starter relay and increasing the wire diameter from the relay to the starter solenoid. I also fitted a direct battery voltage feed to the injector relay, problem appears resolved. Details of both these 'fixes' on on the various Guzzi chat sites. Really enjoy riding it much, more fun than my Yamaha Vmax and the BMW RT1100 I sold to fund it and different too. Twiggers got the leak sorted for me last week. It turned out that the engine seal was fine, but the main bearing gasket was weeping. They replaced the seal anyway while they were in there, and also greased the swingarm bearings, so hopefully that'll have saved more work later; the clutch apparently was fine. Congratulations. I love my Breva more and more. I hope you enjoy yours as much as I do mine. I see yours has HB panniers. Looks good. I have some on my Cali, and I've been wondering about getting pannier rails so I can use them on the Breva too. I just might do that now! Having worked with vehicle electronics for 20 years I would suggest black box terror is a case of fear causing the problems. 99% of problems are wiring loom issues and components in tough conditions such as wheel speed sensors. Untrained grease monkeys without modern diagnostic equipment however gravitate towards swapping the terrifying black voodoo box. It's the equivalent of an auto electrician concluding that the rumbling noise from the back end must be the main bearings without checking the tyre pressures. If you get a fault buy or ask to see the OBD2 reader. With the right tools they literally tell you what to change. 14,000 - its not even half way to being run in!! !